Rex Art's Gessos and Grounds Department features great discounts!! Daler-Rowney Gesso Primer has been formulated for use as a ground for both oil and acrylic paintings. It provides great coverage at a fantastic price and comes in a convenient stackable and resealable rectangular container. Daler-Rowney Gesso Primer has been formulated for use as a ground for both oil and acrylic paintings. It provides great coverage at a fantastic price and comes in a convenient stackable rectangular container. 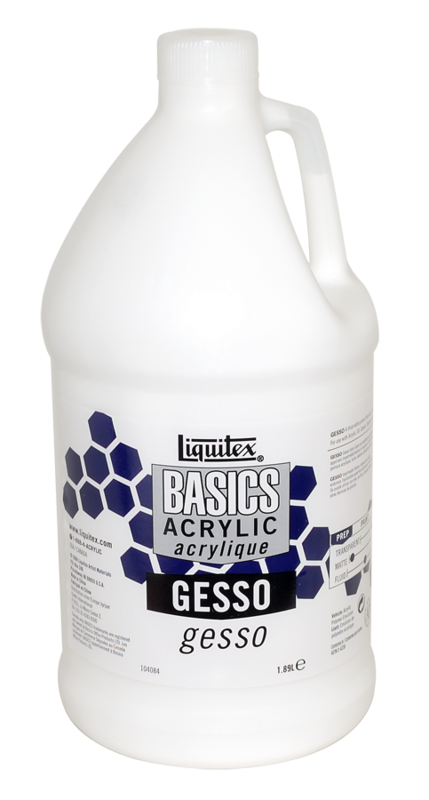 Liquitex Acrylic Basics Gesso - Size: 16 oz. Seals and prepares any absorbent surface for acrylic or oil painting. 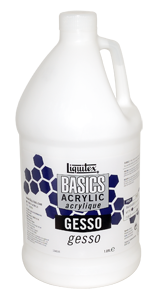 Liquitex BASICS® Gesso is an inexpensive acrylic gesso used to prepare painting surfaces for acrylic and oil paint. Use undiluted or thin up to 25% with water. When thinning more than 25% use an equal mixture of water and Liquitex Matte Medium to thin gesso. 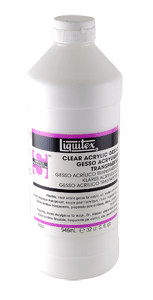 Liquitex Acrylic Gesso - Size: 8 oz. 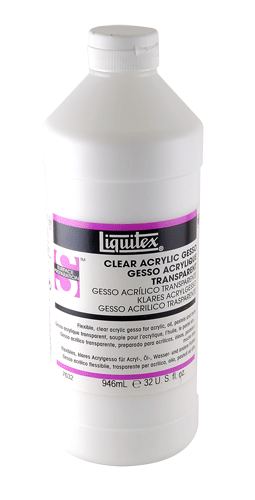 Liquitex Acrylic Gesso - Size: 16 oz. Liquitex Acrylic Gesso - Size: 32 oz. Liquitex Acrylic Gesso - Size: 128 oz. Liquitex Acrylic Colored Gesso - Color: Black - Size: 8 oz. SLUDGE is the newest Tri-Art acrylic to hit the shelves. It is a by-product of acrylic paint manufacturing. It is the combination of the precipitated solids amassed from their wash water, which has then been re-processed into thick and thin acrylic paint formats. The waste solids are made up primarily of assorted pigments, additives (such as calcium carbonate, coloured Mylar and matting agents) and dried acrylic particulate. These act as the colorant in this product. SLUDGE has the same handling qualities as regular acrylic paints and can be used as a paint, primer or paint medium. It is manufactured with 100% acrylic emulsion, is semi-opaque and contains a fine particulate giving it a lightly toothy texture. Sludge is produced from the accumulated wash water from production. SLUDGE is predominantly neutral grey in tone as the combination of colors produced in the factory during a certain time period dictate its hue. Occasionally Tri-Art uses off-spec or factory spills to obtain the batch color. No two batches are alike, thus SLUDGE is not assigned a color name but rather is refered to by its Batch #. SLUDGE is made through a process of flocculation, separation, pressing, filtration, re-dispersion, production and packaging. 100% of water used in the factory for clean-up processes goes into a waste pit and is then pumped into a storage tank. The water is chemically processed every two weeks by flocculating the washwater. The accumulated solids sink to the bottom of the tank (1). The clear water is then siphoned off and re-introduced into the plumbing system and used for cleaning. The remaining semisolid material is then pumped into a filter press (2) that compresses it at 9000 psi into what is called press cake. These cakes are then broken up and re-disperse into water to form an aqueous dispersion. The aqueous dispersion is re-filtered and is introduced into thick and thin acrylic paint bases. The resulting SLUDGE is then packaged, labeled and is ready for use. SLUDGE is an economical alternative to both a neutral ground and neutral color. It can be used in the place of gesso when a muted base is desired. SLUDGE is semi-opaque and although grey in tone, can be used in small quantities as an opacifier or medium toned color extender. The Thick SLUDGE has similar texture holding capabilities as high viscosity colors, while the Thin version is comparable to a liquid acrylic. There is a quantity of solid particulate in the paint, giving SLUDGE a light tooth that make it a suitable ground for mixed media applications. As this is paint made with 100% acrylic emulsion, it is comparable in character to other acrylics. Hence it is highly adhesive to a variety of surfaces, dries to a water resistant, semi-gloss finish and can be easily applied with painting tools. SLUDGE may contain every product Tri-Art manufactures. Each batch is sent to a lab for content testing. If there are traces of Cadmium or Nickel, this will be noted on the label.